LOS ANGELES (AP) — Anthony Kiedis had a dream the other night. The 49-year-old frontman of the Red Hot Chili Peppers imagined that he was playing at this year's Rock and Rock Hall of Fame induction ceremony, and the band's on-again, off-again guitarist John Frusciante was sitting in the front row. Kiedis is quick to note that this vision won't become a reality when the 29-year-old group is actually inducted Saturday. "No," Kiedis said in a hushed tone during a break from rehearsing at SIR Studios last month. "That was just a dream." "I can't speak for (Frusciante), but I think it's kinda like an ex-girlfriend vibe," added 49-year-old bassist Flea. 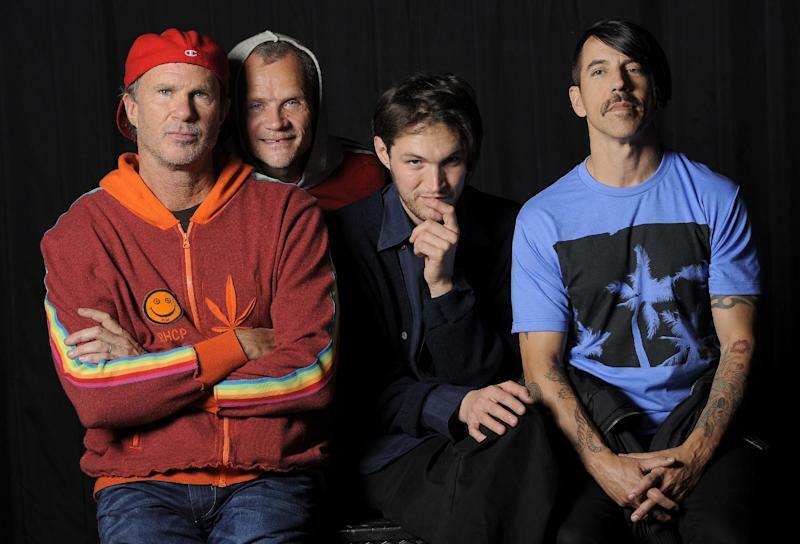 The current line-up of Flea, Kiedis, drummer Chad Smith and guitarist Josh Klinghoffer will be honored along with past bandmates like late founding member Hillel Slovak, the original Chili Peppers guitarist who died of a drug overdose in 1988, and Frusciante, who replaced Slovak and recorded five albums during his fluid tenure with the group. "We wouldn't be here without (Slovak) because we wouldn't have started without him," said Flea. "For him to be honored and recognized is a beautiful thing for us, not that we don't honor and love him every day, but I feel great for him to go in, as well as John Frusciante, of course, who gave us so much and did some serious (expletive) rocking." But the guitarist whose melodies powered songs like "Under the Bridge" and "Californication" is not expected to be a part of the festivities in Cleveland, where the Rock Hall is based. A spokesman for Frusciante, who left the Chili Peppers for a second time in 2009, didn't return messages seeking comment, but Kiedis and Flea do not anticipate he will be there, and a rep for the ceremony says he is not scheduled to attend. Nonetheless, the group will still be in good company. The Chili Peppers are set to be inducted alongside Los Angeles rockers Guns N' Roses, New York hip-hop trio Beastie Boys, Scottish folk icon Donovan and British rock group The Small Faces/The Faces, which featured Rod Stewart and Rolling Stones guitarist Ronnie Wood. Other honorees will include late singer-songwriter Laura Nyro and blues mastermind Freddie King. Flea likened the induction class of 2012 to a family reunion: He grew up in LA around Steven Adler and Slash of Guns N' Roses; on the East Coast, the Beastie Boys followed a similarly daring trajectory at the same time as the Chili Peppers; and Wood has served as a father figure to the group. Wood even joined the Chili Peppers in 2009 for their side project, The Insects. Kiedis said the band plans to play a few songs at Saturday's ceremony, and they will be joined by former Chili Peppers drummers Jack Irons and Cliff Martinez for "a three-drummer jam session." He also teased that the Chili Peppers would rock out with several of this year's other honorees for a funkadelic mash-up. "It's funny," said Kiedis. "People have asked me, 'Did you ever think you would be inducted into the Rock and Roll Hall of Fame?' It's a funny question because the answer is, 'Of course not.' When we started, we thought maybe in periods of 24 hours at a time. The most we would ever think is a week at a time: 'Oh, we have a gig next Thursday. We should write a song.'" 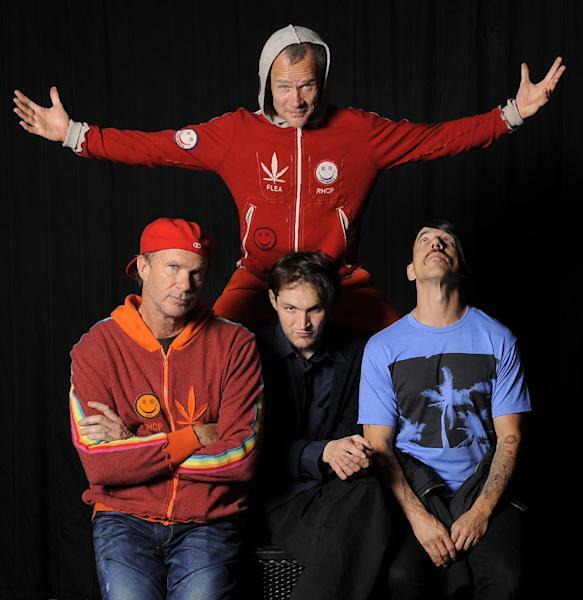 Mixing layers of funk, punk, heavy metal, rap and traditional pop over a foundation of rock, the Chili Peppers have managed to achieve a consistent level of mainstream success since their formation in 1983, selling more than 83 million albums and winning seven Grammys, all while maintaining their rebellious — though sometimes unhealthy — sensibilities. The hall of fame honor comes at a time when the group is literally getting back up on its feet. The North American leg of the tour in support of their 10th studio album, "I'm With You," had to be postponed earlier this year when Kiedis needed surgery on his foot, which was reinjured in St. Barts during a game of "toilet tag," a rollicking variation on the childhood classic. "We had to derail the whole momentum of this beautiful tour we were on," said Kiedis, whose foot has since healed. "We were really having a good time. It turned out to be a blessing in disguise because not only did I get to slow down and surgically repair this busted hoof, but we all got to be home for the most beautiful winter on record in Los Angeles." For the sometimes manic but always thoughtful Flea, who was born Michael Balzary, the unexpected break provided him with time to learn how to play bebop music and train for the LA Marathon. (He finished with a time of 3:41:49, improving on his time of 3:53:00 from last year's marathon.) More importantly, he said it was an opportunity for introspection. "I've come to a place in my life where I accept the difficult parts and embrace them," said Flea. "Whereas, before I was sort of trying to minimize the hard parts and maximize the fun parts. Now, I just want it all. I want the pain. I want the suffering, as well as the transcendent beauty of playing with my loved ones. I'm into it." During the downtime, Flea also started writing new music with Klinghoffer, who joined the band in 2009 and co-wrote on "I'm With You." It's something that Kiedis expects to continue on their tour, which picked back up March 29 in Tampa, Fla., and is scheduled to continue through Nov. 1 in Milwaukee, Wis., with stops in the United States, Canada and Europe. "In the past, we traditionally write, record, tour, take a little break, write, record, tour, you know, that whole thing," said Kiedis, who detailed the band's sorted history and his own struggles with addiction in his autobiography "Scar Tissue" in 2004. "This time, for whatever reason, it feels like new music is waiting in the wings to happen."